It is everywhere – shampoos, orange juices, and even tattoos tout them. It’s the humble, ubiquitous barcode. My name is O’Ryan Smith. I’m the product support manager at Juniper Systems, and I’ll show you how to scan a barcode with any one of Juniper Systems’ rugged mobile computers and tablets. The barcode is a midcentury invention that stemmed from Morse code and eventually evolved into one of the most recognizable symbols in the world. The symbol is scanned billions of times every day. It proliferated after a coalition of grocers in 1973 chose vertical lines to represent its Universal Product Code, a unique 12-digit code assigned to an item for identification and tracking purposes. Barcode technology, like other asset tracking technologies, has advanced significantly. However, the core of the technology remains largely the same. Barcode scanners read the black and white elements of a barcode that represent numbers and letters. These codes often link items to an inventory tracking system that maintains product information like price, quantity, and location. Since its inception, two types of barcode have emerged: linear (often referred to as 1D) and 2D barcodes. The most recognizable type of barcode is the linear barcode, which uses vertical lines to express text information. More recently, 2D barcodes have come into vogue. These barcodes utilize stacked vertical and horizontal elements to represent additional information within the code itself. QR codes are a popular 2D barcode. They can hold more than 7,000 digits or 4,000 characters of text. You can scan a barcode with any of Juniper Systems’ rugged mobile computers and tablets. The Mesa 2 Rugged Tablet, Allegro 2 Rugged Handheld, and Archer 2 Rugged Handheld can all include a weather-ready barcode scanner. The two optional barcode scanners available for Juniper Systems products are both 2D imagers, which can read both linear and 2D barcodes. Zebra, formerly known as Motorala Solutions and often called Symbol, builds both scanners. Juniper Systems provides a setup utility called Barcode Connector, which also provides a wedge function. The wedge function decodes digital signals from the barcode reader, converting them into keyboard inputs or storing them in the clipboard to paste into other applications. The Mesa 2 features a SE4710 Barcode Imager and a PL3307C 400 MHz scan engine decoder. Working together, these technologies make the Mesa 2 a formidable barcode reader. 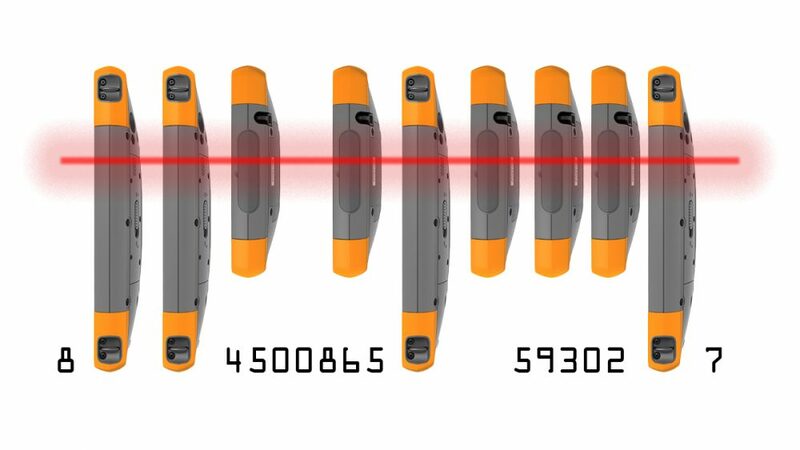 At most angles, it can read barcodes in milliseconds from a distance of 24 inches with certain barcode types. In addition, the Mesa 2 with barcode can include an attachable pistol grip scan gun trigger. The ergonomic pistol grip increases input speed. Which Mesa 2 mounting option is best for you? The Allegro 2 and Archer 2 feature a SE4500 Array Imager and a PL3307C 400 MHz scan engine decoder. This scanner quickly reads barcodes from a distance of 12 inches with certain barcode types in broad daylight. Juniper Systems’ built-in barcode scanners utilize the Barcode Connector application to scan barcodes. 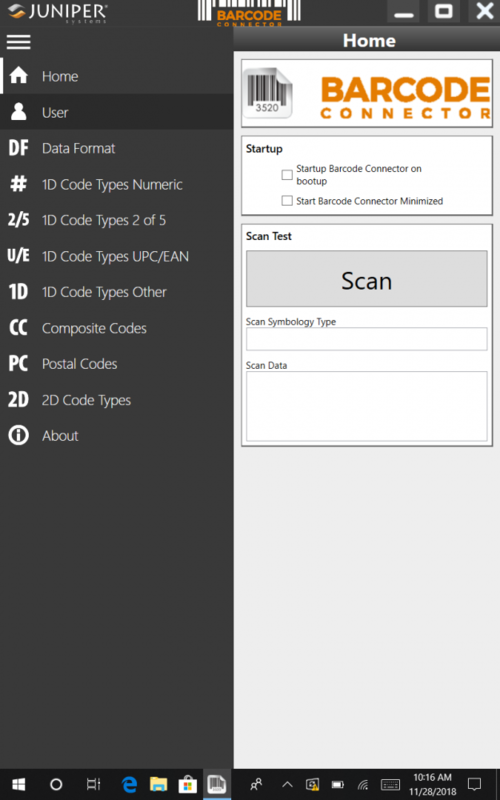 Here’s how you can scan a barcode using Barcode Connector: Select the Barcode Connector application and select Scan to populate Scan Data. The lefthand side of the application lists several barcode formats. Many users run the Barcode Connector application in the background, operating the Scan feature with a configurable button that scans a barcode once it’s clicked. External barcode scanners provide you with a variety of options to scan barcodes on Juniper Systems’ rugged mobile computers and tablets. These scanners are highly variable and can connect to your device through several different mediums. Some external barcode scanners connect via a USB, RS-232 serial port, or Bluetooth. External scanners offer different reading speeds, distances, and widths. Some are rugged. Others are not. The advent and ubiquity of modern digital cameras have made barcode scanning more accessible than ever to the public. Any smart device with a digital camera and a barcode scanning software can read a barcode. You can read a barcode from your smartphone and, of course, your Juniper Systems rugged device – as long as it has a built-in camera. Image-based barcode scanners are leading a revolution. The technology is quickly replacing traditional laser barcode scanners and might eventually lead to the disappearance of traditional black and white barcodes, as we know them. Walmart has begun testing barcodes that are invisible to the human eye. However, advanced image-based barcode scanners far outpace the technology currently available to you with a digital camera and software application. High-quantity or high-complexity asset tracking operations should defer to built-in barcode scanners or external scanners. If you occasionally need to scan a barcode, here are four barcode scanner apps available in the Microsoft Store and Google Play store.